When the pürminerals Jupiter Ascending Collection* ($29 USD/$35 CAD) showed up in my mailbox, it was the first that I was hearing about the Jupiter Ascending movie. However, if you're not living under a rock like I am, you'll know that Jupiter Ascending is an upcoming movie starring Mila Kunis and Channing Tatum. Well, pürminerals has a new collection inspired by the film, and I have all of the details for you today! pürminerals' Jupiter Ascending Collection contains an eyeshadow palette with 6 shadows (1.5g each). Honestly, the packaging is a bit big and bulky for the amount of shadows that it holds, but it will appeal to movie buffs. This palette does come with a shadow brush, but my bristles were already shedding a bit, so I do prefer to use my other brushes. These shadows seem to vary in quality, and my favourites are Night Sky & Jupiter. Night Sky is a beautiful metallic pewter with a creamy formula. 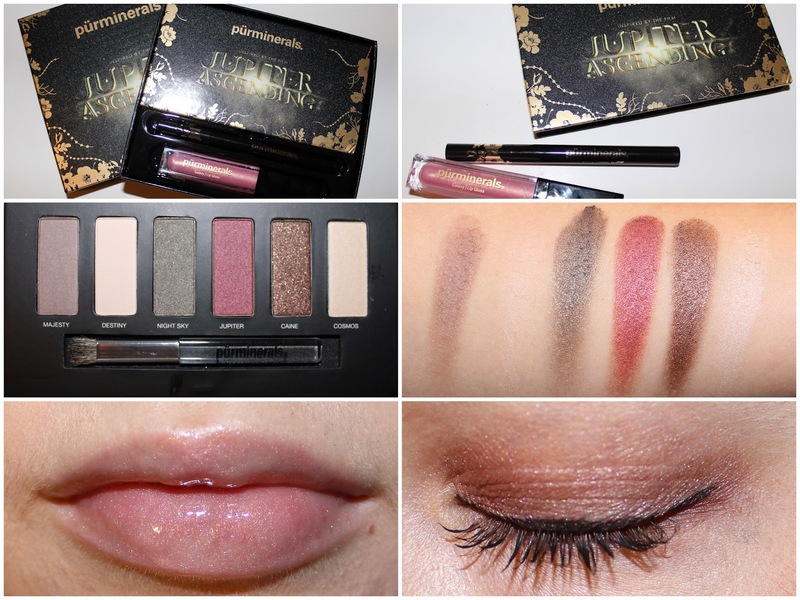 Jupiter is a rusty purple with a shimmer finish & awesome pigmentation. Destiny is a creamy beige but it really lacks pigmentation. This shadow is a satin finish, even though it looks matte in the pan. Cosmos is a glitter off white, but it can look chalky if you use too much. Majesty is shimmery taupe, but the pigmentation wasn't superb. Caine is a shimmery bronze with great pigmentation, but formula is on the drier side. When worn without primer, these shadows last for about 4 hours before starting to fade. I would have liked for a true matte shadow to have been included in this palette. pürminerals' Outer Space Precision Eyeliner comes in black and gold sleek pen packaging. This format is very similar to Stila's liquid liners, but the tip on this pürminerals liner is quite stiff. You get no flexibility with this applicator, and in addition to that the formula is on the drier side. I find myself having to almost drag this liner over my lid. The stiff tip also makes creating a winged tip a bit difficult. I would have liked for this liner to have been a bit more pigmented, since it isn't a true jet-black colour. Now on to the star of this collection, the Galaxy Lip Gloss! This gloss comes with a mirror on the side of the tube and a built-in light, so you can easily apply this gloss on the go. I'm in love with the baby pink colour with iridescent shimmer. I think that this shade looks amazing on my lips! The formula is creamy and not sticky at all, and it sticks around for about 5 hours - pretty great! Overall, while I was incredibly impressed with the gloss, I wasn't blown away with the majority of the shadows or the liquid liner. If you're incredibly excited about the movie, then you might want to pick up this set as a collectible item. Otherwise, I think that there are better sets available for your money! pürminerals' Jupiter Ascending Collection is available exclusively at Shoppers Drug Mart for a limited time only. Aww that gloss is gorgeous! Can't wait for the movie! I agree, that gloss is super gorgeous!! Thanks! And the formula is amazing - not sticky at all! Wow everything seems amazing - I totally love all the shades in the eyeshadow palette! I didn't love the formula of the shadows or the liner, but the colours are quite pretty! It's weird that the eyeshadow quality varied so much! I saw this at Ulta a while ago and was really interested... but if the gloss is the only really good part to the kit I might pass :/ Thanks for the review! Ya I was surprised by how much the shades varied! I've seen other bloggers give this set great reviews, so maybe I just got an off palette... who knows! The formula of them isn't amazing - a bit dry! Pur minerals is one of my favorite brands. I've been wearing their powder foundation for ever! I like their eye shadows because they are subtle and don't irritate my eyes but that gloss is the showstopper! I agree, the lip gloss is just incredible!